The project Contaminant collectively describes a series of investigative studies culminating in a responsive architectural installation. 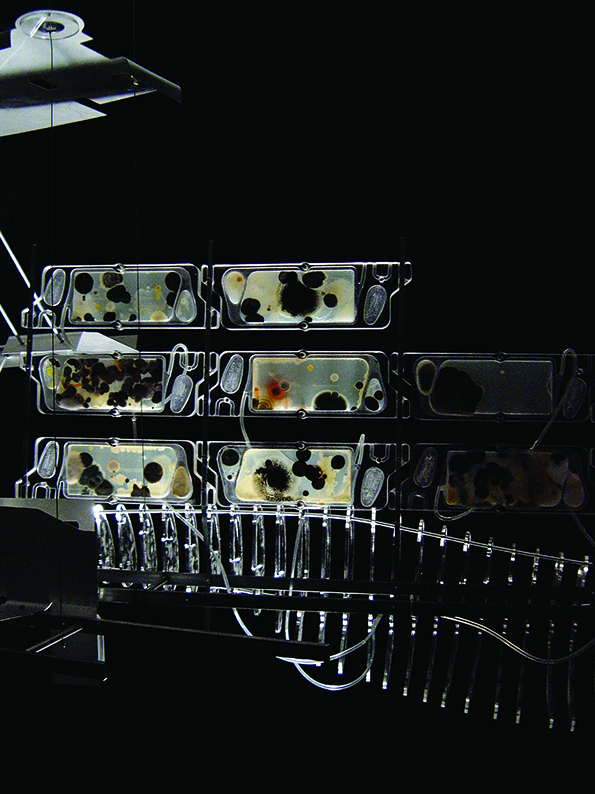 Rather than considering the ability of micro-organisms to modify their immediate environment, as with previous work such as Algaetecture and Nonsterile; the objective of this study was to investigate the monitoring capabilities of an installation deliberately designed to apprehend and develop locally present microbes and to reveal the resultant morphological aesthetic. Initially, a series of portable monitor vessels were created. These monitor cells were exposed to particular locations and their attendant microbes in order to discover the common micro-organisms present and to identify those specific to a given environment. The results were demonstrative. Aspergillus, commonly present in the fabric of our built environment, and Micrococcus that populates the surface of our skin, proliferated across all the monitor cells. But other more distinct microbes, directly associated with plant, fruit, bread or dairy material present at the particular site of exposure, gave rise to unique visual transformations, in turn revealing an almost epidemiological history. The investigation progressed to the proposition of an architectural intervention; a designed object embracing the disciplines of microbiology and mycology, alongside architecture and engineering. The structure, incorporating responsive monitor vessels and the support systems required to sustain them, is hypothetically located where arbitrary micro-organic material would be incidentally introduced. The subterranean vascular network of the London Underground provides airborne highways for particulate matter across the city. London’s inhabitants act as unwitting hosts to microbial populations, introducing catalytic material describing individual daily activity. A series of monitor vessels and occupational clusters are proposed to colonise a redundant portion of Holborn Station, capturing and propagating the ambient particles. To construct this proposed condition, a 1:10 scaled installation was created; nevertheless incorporating authentic monitor vessels and their associated support systems, facilitating the chemical, humidity and temperature controls necessary. This resulted in an architecture of contamination where the fabric and spatial possibilities of the installation reconfigured with every microbial progression. A multitude of processes were utilised to create the monitor vessels, including CNC milling and laser cutting, vaccum forming, various laboratory equipment and incubators.